When is the last time you had a dental checkup from your cosmetic dentist? Most people in the Tampa area between the ages of 30 and 80 need a dental checkup every six months. If you live in Tampa and are at higher risk for oral diseases, you should have your teeth checked every four months, or at least three times a year. Come into our office, located at 3203 LIthia Pinecrest Rd. 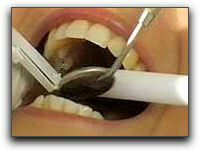 in Valrico, or give us a call to make a dental appointment. You can visit our website at / for more information. Most people in our Tampa community are in a medium to low risk category. However if you use tobacco or alcohol, eat a lot of sugar in your diet (including lots of soda), or have poor oral hygiene habits, you are likely in a higher risk category and should have your teeth checked right away. I look at a lot of factors to determine your personal dental hygiene, and your dental outlook for your future. I want you to have the healthiest smile possible so that you can enjoy your teeth for many years without significant problems. If you live in the Tampa area and are ready to have your teeth checked, please give Five Star Dental Care a call. When you come into our office, you may decide to take advantage of some of our many cosmetic dental treatments such as dental implants, dental crowns, and porcelain veneers. Our knowledgeable staff will be ready to get you started with a dental checkup. —Jeff Bynum, DDS, Dental check ups for the Valrico community. Reach us at 813-653-2273. This entry was posted on Thursday, November 11th, 2010 at 5:49 pm	and is filed under General Dentistry. You can follow any responses to this entry through the RSS 2.0 feed. Both comments and pings are currently closed.